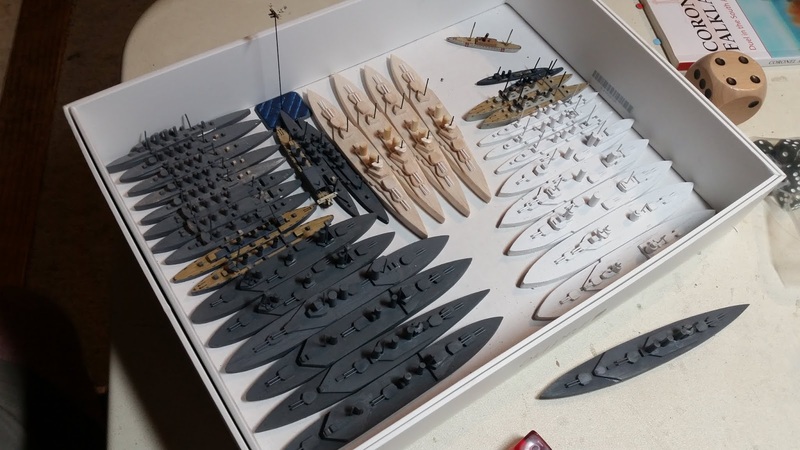 In a previous article, I went over how I scratch build ships for my Jutland project. Once they are built, it's time to throw some paint on them. But before I get into that, I need to reiterate something important to this project. Part of what makes this project achievable in my context is by sticking to a low fidelity art style. 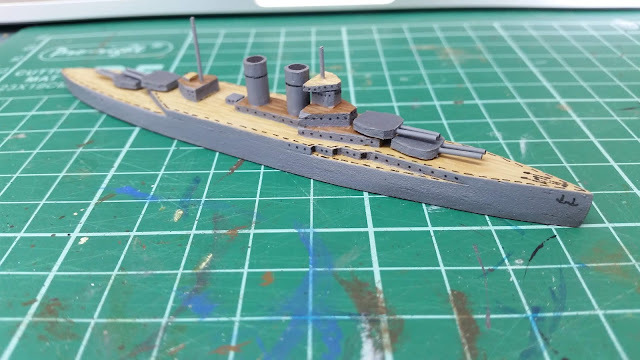 I've stuck to the simple designs found in Jane's Ships of World War I and this spirit of lo-fi, I've adjusted my expectations during the painting and detailing phase accordingly. So what you'll see here has a level of abstraction built in to the process. Once the model has everything firmly glued into place, give it a really thorough dusting to get all of the sawdust off of them. After that I hit them with a primer. 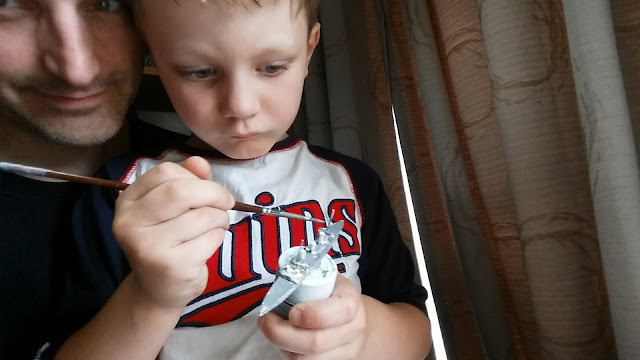 In the picture above, you can see I used two different primer colors. British ships used a dark grey so I chose a grey primer for them. German ones had a light grey scheme and so I decided to start with a white primer for them. Next I add 25% white to my my Green Ochre to lighten it. 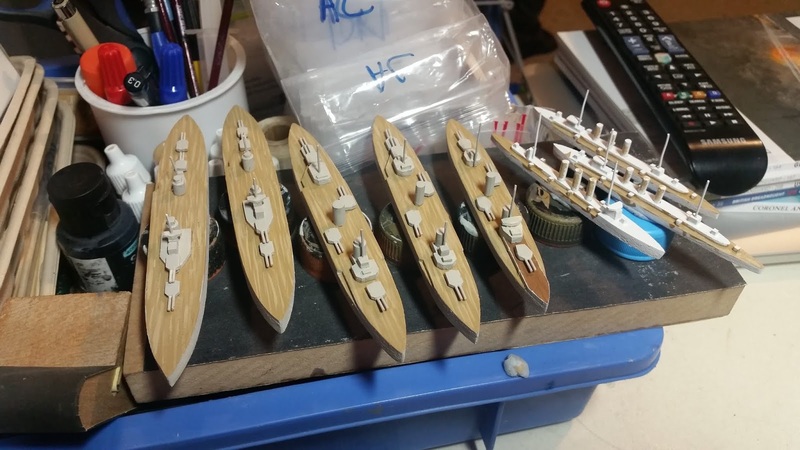 Using a small paint brush, I start lightly painting in streaks lengthwise along the hull. Again, I'm not concerned with getting the color on the sides. Then I add in more white for about a 50% mix with the green ochre. I get a finer brush and again make long straight streaks along the decking. At this point it should look like a wood grain pattern. Some upper decks were painted in a darker brown. For these surfaces I start with Vallejo Flat Earth (No. 143) and work in some Green Ochre using the steps above. Both German and British turrets were dark grey on the top, so I painted them Vallejo German Grey (No. 167). Finally, I paint the bottom Vallejo Hull Red (No. 146), just for a spot of color, not that you can see this when the ship sits flat! After the decking is done I then clean up the vertical surfaces. For the British ships, I used Vallejo London Grey (No. 161) and for the German tanks, I used Vallejo Deck Tan (No. 110). I also made sure that all masts, funnels, secondary batteries, and superstructures that were metal are also painted in these colors. Once the paint is dry, I start detailing. 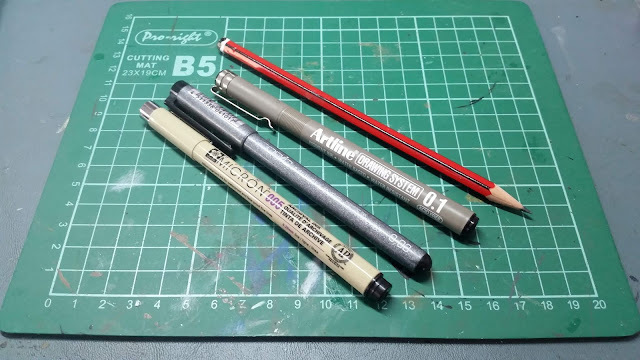 I use a variety of technical pens for this work. 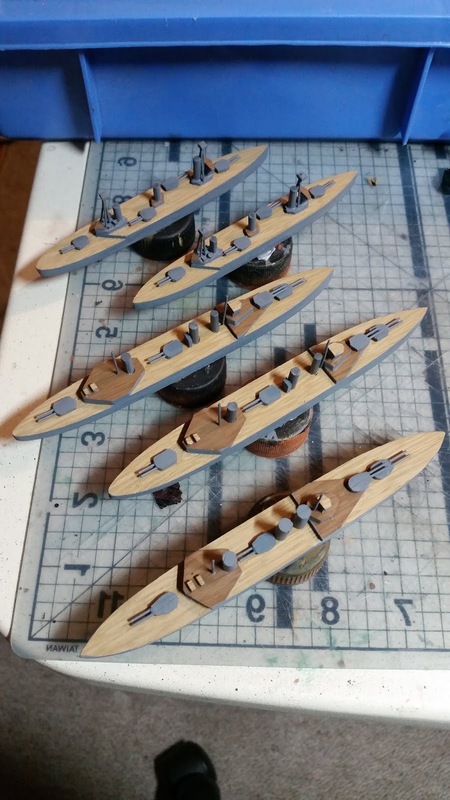 I start by using the 0.1 pen (or 0.03 depending on the ship size) for adding portholes to all of the decks. I use historical photos to verify where the most obvious portholes should go, but I don't stick to them as gospel. Next I color in the end of the gun barrels and any other openings, such as behind secondary battery gunshields, etc. Using the .005 pen I add a thin dashed line around the ship to simulate the railing and then add a pair (or two in the case of larger ships) of anchors in the bow. Then I draw the anchor chains in the bow. The final thing to so are the the funnels. I start by putting a black dot on the top in the center using a sharpie or the thickest technical pen I have available. Then I work my way out in a slow spiral action until I'm close, but not touching the edge of the funnel. Finally, I draw a stripe around the funnel to give it some detail. I give the ink on the ships some time to dry and then I blue-tac them lightly to a large board with about an inch or so between them. Having been used to varnishing resin/metal and even plastic kits I didn't think to blue-tac the models down. They obviously went flying off the board when I started spraying! 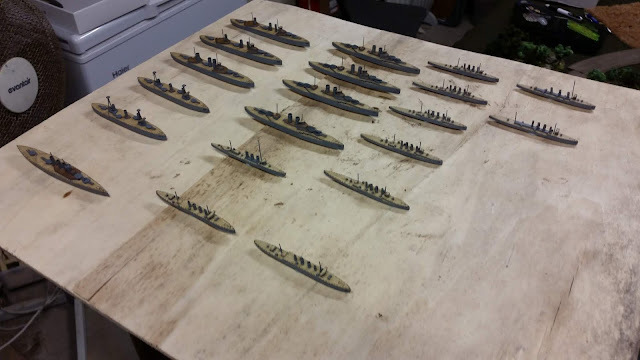 Anyway, once they are securely stuck down, I then spray varnish them all with a few coats to help seal and protect them. After a few hours of drying time, they are ready!